We rely on the support of an amazing group of volunteers who support the organisation in a variety of ways – working on the museum collection, helping with events, and running the heritage centre. We’d also like to hear from people who may be interested in joining us as a trustee. 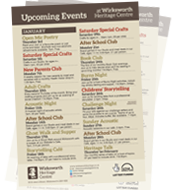 Wirksworth Heritage Centre has around 60 members who support the organisation. Our membership scheme is currently being reviewed, and more information will be available here soon. Could you help us develop our historic collections and special exhibitions? We’re seeking a part-time (15 hrs per week) Collections Officer with museum experience to help manage and develop our museum collection. For details and an application form please email info@wirksworthheritagecentre.org. This post is funded by the National Lottery Heritage Fund, with a closing date of 12 noon on Monday 15 April. We’re also looking for a writer/graphic novelist to produce a graphic novel or comic inspired by George Eliot’s Adam Bede and the novel’s links to Wirksworth. This residency will run alongside a new exhibition about George Eliot as part of the bicentennial celebrations of the author’s birth. The writer in residence would re-interpret elements of Adam Bede in the form of a graphic novel or comic, inspired by some of the figures and places in Wirksworth, and we intend to publish a limited run of the final work and produce it as an ebook. The writer would also be required to run 2 family sessions during the residency. This would involve working with young people and encouraging their own creative responses to their town. There is a project fee of £1050. Please submit a response to the brief, including a CV, by 4 April, to Heather Green at heather.green@wirksworthheritagecentre.org.